T�ai Chi Ch�uan is a part of the rich cultural heritage of China, resulting in many theories and writings on its exact origin. Literally translated as �Grand Ultimate Fist�, Tai Chi was originally developed as a martial art, but over the years has gained popularity as an exercise for health and meditation. Based on the philosophy of Taoism and the principles of Yin and Yang, T�ai Chi Ch�uan incorporates a balance of opposites, such as full and empty or using the soft to overcome the hard; hence, the proverb of using �Four Ounces To Deflect A Thousand Pounds�. Tai Chi also distinguishes itself from other martial arts in that it is an �internal� form using the power of �chi� instead of the normal brute force used in other martial styles, making the most efficient use of the body with the least amount of effort. Of the five main schools of T�ai Chi Ch�uan, namely the Chen, Yang, Wu, Sun, and Zhao Bao styles; the Yang style is the most practiced form of Tai Chi in the world today. It was through the efforts of its founder Yang Lu Chan, and later his grandson, Yang Cheng Fu, that T�ai Chi Ch�uan has such a large following. As Lu Chan�s reputation for both his martial prowess and teachings became legendary, the Yang form was popularized throughout China. He ultimately attained such mastery that he would never be defeated and became known as �Yang the Invincible�. Yang Lu Chan trained in the Chen style of Tai Chi for approximately eighteen years, learning his art from Chen Chang Xin. The story goes that Chen was a student of Jiang Fa, whose master was Wang Tsung Yueh. From this lineage, the art was traced back to the Internal Boxing founded by Chang San Feng, a Taoist monk residing on Wu Dang Mountain. 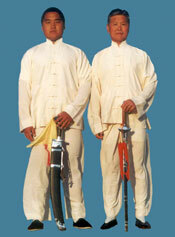 The Tung family Taijiquan began with Tung Ying Chieh who was a student of Yang Cheng Fu. Before studying with Yang Cheng Fu, however, Tung had already studied the Wu Yu Xiang style of Taijiquan from Li Xiang Yuan. Later he would make the Yang style his main form. In addition to the traditional Yang style forms, Tung also created a fast form of Taijiquan unique to his lineage. This fast form was based on the fast form of Wu Yu Xiang style Taijiquan and Yang style Taiji Long Boxing. This new form was taught as an advanced form to worthy students. Tung's ability at Taijiquan made him a sought after master and he later moved to Hong Kong and popularized the art there. Today, the Tung family Taijiquan has spread across the world to countries like America, England, Europe, Australia and in regions like South East Asia. The Tung family continues to teach their art to a growing number of enthusiasts around the world.